If you like big 60's orchestral soundtracks combined with 00's British indie music check out this group's album "The Age of the Understatement". If there is anyone who should be doing a James Bond song, it's these guys. Volver was such a good film. Definitely one of my favs from last year. I went in not knowing what to expect, and I found it a very engaging and touching film. The Host is excellent! It really is one of the best action/adventure films I've seen in ages and reminded me of classic Steven Spielberg films. I love that sequence where the daughter is running along the river with the music playing. I'm all about the Captain Falcon action (even if I do usually end up losing). Nothing like a good strong Falcon Punch. That's a really cool design. My main quibble would be that it feels awkward where the line is lost around the fish's mouth and perhaps instead the line could continue but be thinner. Very cool. The design of the piece is really fun. 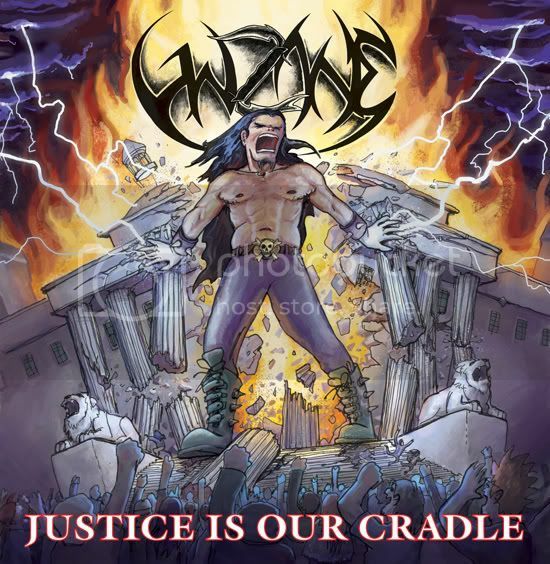 Topic: Justice is Our Cradle! Here's a CD cover that I came up with for the heaviest metal group out of Puerto Rico, Unzane. It was fun to do something so Over The Top, with extreme lighting, extreme explosions and extreme just about everything else. Yeah, the heart-carving up one is brilliant. Great idea and well executed. I like the fact that it feels a bit realistic, but also cartoon-like at the same time. Even without understanding the words, I still have a pretty good idea of what is going on. I love the use of texture and your linework. Topic: who let the pumkin's out? This is great. It's fun to look for all the little details. I could totally see this as an old school platform video game or board game.